Tag Archive | "Simon McKay"
Multi currency investments fight inflation and can enhance wealth but require a long view . There is a screech owl that lives in our barn and the way I watch him is sort of how I invest. Can you see the owl? To begin, an investing idea starts with a speck of thought…seeing the whole picture, but without many details. Then it’s time to connect dots to see a closer picture. until we can finally zoom in. At this stage when we have zeroed in, we can act. One big idea I have been tracking and investing in, is water. Now I am zeroing in on a new sub interest…water desalination. An article sent by a reader entitled “Australia Turns to Desalination Amid Water Shortage” by Michael Sullivan first piqued my interest. The article told how the Kwinana Desalination Plant, near Perth, produces 40 million gallons of drinking water per day from the Indian Ocean. Perth, with a population of about 1.7 million, is growing 3 percent a year — about 750 families a week move to the city, says Gary Crisp of the Western Australia Water Corp. The Kwinana Desalination Plant south of the city opened two months ago. The facility, the first of its kind in Australia, covers just a few acres in an industrial park next to the ocean. The water is sucked in through a pipe about 650 feet offshore in Cockburn Sound, at a rate of about 0.1 meters per second, says project manager Simon McKay. That is slow enough to let the fish escape, but fast enough to provide nearly 40 million gallons of drinking water each day — roughly 20 percent of Perth’s daily consumption. That makes the plant the single largest source of water for the city. McKay says it doesn’t take very long for the seawater to be ready for the tap — about a half-hour from the time it comes out of the ocean until it’s processed and distributed. Desalination plants have been around in places like the Middle East for decades. But they’ve always been expensive to build and expensive to run. New technology has made them cheaper and more efficient, but they still consume a large amount of energy. Environmentalists in Perth balked at the idea of using coal-fired plants to provide power for the one here, forcing the Water Corp. to find a non-polluting, renewable alternative. It found that alternative — wind energy — near the town of Cervantes, a three-hour drive north of Perth. The Emu Downs Wind Farm houses 48 wind turbines, each as high as a 15-story building. Kerry Roberts, the facility’s general manager, says Emu Downs is among the top 10 or 20 sites for this type of energy alternative in Australia. “If you look at the combined output of the wind farm at maximum wind speeds — 24 to 28 miles per hour — you’re looking at an output of close to 80 megawatts,” Roberts explains. That’s enough power to run Perth’s desalination plant, 160 miles to the south. Other water-stressed seaside cities in Australia are taking a serious look at desalination, as traditional water sources dry up because of lack of rain. Sydney, on Australia’s southeast coast, is expected to commission a plant even larger than Perth’s in the next few months. Nonetheless, the desalination boom extends far beyond Australia’s shores. McKay — the man in charge of getting Perth’s plant running — will soon be off to Muscat, Oman, to build another. His company’s order book is filling up quickly, he says, and he doesn’t expect that to change in his lifetime. Neither does Crisp. “The world is going reverse osmosis,” he says, naming projects proposed from California to Spain. Looking around, I found that one of the largest desalination plants is not far from where I lived (Naples) for years, Tampa Florida. The Tampa Bay Seawater Desalination facility is an integral part of the Tampa Bay region’s drinking water supply. This is claimed to be a drought-proof, alternative water supply that provides up to 25 million gallons per day of drinking water to the region. There are large desalination projects underway in California as well. However a look at the top 50 desalination projects show that the majority of them are in the Middle East. Desalination is a sector that is bound to grow. It is estimated that 2.8 billion people live in areas of high water stress and this number is expected to increase by 50% over the next 20 years. Areas of greatest concern include India, China and the Middle East. There are two forms of desalination, evaporation and reverse osmosis (salt water forced through a filter under high pressure). There are already over 10,000 desalination plants going, mostly in the Middle East. There are huge expenditures underway for desalination and wastewater purification and a number of companies are cashing in on this fact. General Electric may be in the lead. It purchased Ionics, which builds desalination plants and makes filter membranes. The French company Veolia Environnement (VE) is a major desalination plant and membrane supplier. This company earns over a third of its revenue from water businesses. The Japanese chemical company Nitto Denko (6988.T) is a large membrane supplier as is Dow Chemical (DOW), DuPont (DD), and GE. Desalination plant builders include Italian Impreglio (IPGOF), South Korea’s Doosan Heavy Industries & Construction (DOHIF), French Suez (SZEZY), German Siemens (SI), and Spanish construction companies Acciona (ACXIF) and Abengoa (ABGOF). We have written often about Singapore-listed Hyflux (HYFL) which makes filter membranes used to purify water and builds desalination plants. Hyflux is building a 500,000-cubic-meter per day desalination plant in Algeria, which, when completed in 2011, will be the world’s largest. Hyflux is also building 40 water treatment plants in China, where it gets 81% of its revenue. This share is in our Green portfolio as is Japan’s Kurita Water Industries (6370.T) which builds desalination plants and sells other water purification equipment, getting all of its 205 billion yen [$2 billion] in revenue from water-related businesses. Canadian H2O Innovation (HEO) makes filtration membranes for wastewater treatment. Austria’s Christ Water Technology (CRSWF) sells desalination and other water purification equipment. American Water (AWK), is in New Jersey and ran the desalination plant in Tampa, which is the largest in the U.S. Energy Recovery in San Leandro, Calif. has also sold shares to investors. Desalination plants are expensive and create local opposition for several reasons. First, they produce a waste of highly concentrated salt water that can destroy the surrounding ocean habitat. Second they require a lot of energy which if created by coal, creates air pollution. The third concern, perhaps the biggest is concern for the organisms that are killed by the process of withdrawing seawater. Tiny fish larvae and plankton are killed in process. Te nature of our existence is such that we cannot eliminate our foot print entirely. very solution to environmental problems seems to create others. Let’s hope that technology will help make desalination one of humanity’s solutions…not problems. Since desalination can produce fresh water where there is none, and water is one of the few items in daily life that has no substitute, I be looking to invest in companies that provide fresh water with minimal impact on the environment. Once I find such a company, will have identified one of many filters we should use when we review value. We look for shares of companies that have a product or service in a wave of the future…such as desalination. #1: Are the shares traded in a good value market? #2: Does the share trade at fair Price to Earnings and Price to Cash Flow ratios? #3: Does the share pay a good value dividend? #4: Do the shares have a good value relative to their previous price? #5: Does the company have rising earnings? #6: Has the share price been rising? #7: Is the company’s management good. My feeling is that desalination will grow especially, that which is provided by wind energy, which is often available at the ocean and in semiarid parts of the world. Shares in companies that answer yes to the questions above will be interesting places to invest. Learn more about economic safety this November. Join Merri, me, Steve, Kjetil Haugan or Thor Anderson of Vistazul and Peter Conradsen of Jyske Global Asset Management in Cotacachi Ecuador. We’ll review economic conditions, Ecuador real estate, my entire portfolio and investing and business ideas for the months ahead. 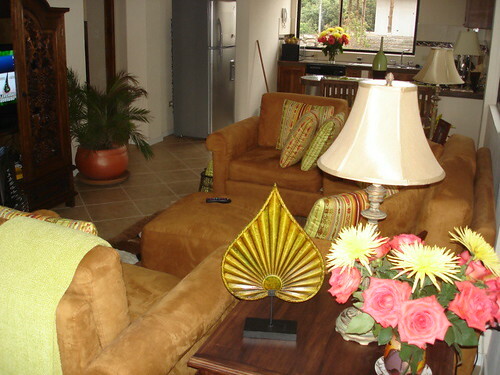 See the wonderful balconies in the Primavera condos at for sale at $46,000 in Cotacachi. Then travel to the coast. 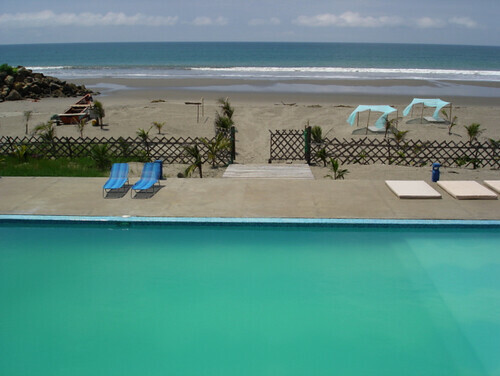 Enjoy the Vistazul swimming pool on Ecuador’s Pacific.